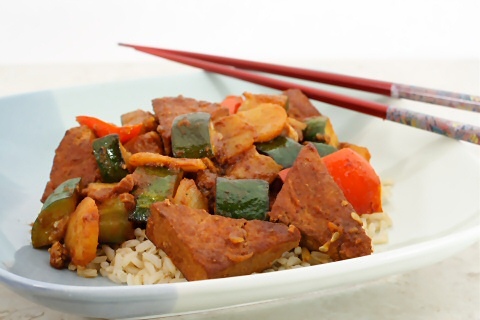 Slow Cooker Vegan Chinese Barbecued Tofu and Vegetables sounds like a great idea for tofu cooked in the slow cooker! Use the Index Page for Vegan Recipes to find more recipes like this one! On a day when she needed the convenience of a slow cooker but it was too hot for traditional soups or stew, Susan from Fat Free Vegan Kitchen came up with this delicious-sounding recipe for Slow Cooker Vegan Chinese Barbecued Tofu and Vegetables. The browned tofu cooks for several hours in a flavorful sauce and then the veggies are added for the last hour so they’re still crisp when you eat this over rice. Don’t you think this sounds like a tasty and easy idea for a Summer Dinner that’s perfect for Meatless Monday! Get the Complete Recipe for Slow Cooker Vegan Chinese Barbecued Tofu and Vegetables from Fat Free Vegan Kitchen. Use the Index Page for Vegan to see all the slow cooker or pressure cooker vegan recipes that have been featured on this site. I have yet to try tofu in the slow cooker, so I'm glad to have a recipe that gives me some guidelines. Lydia, me either, but I am intrigued by it!